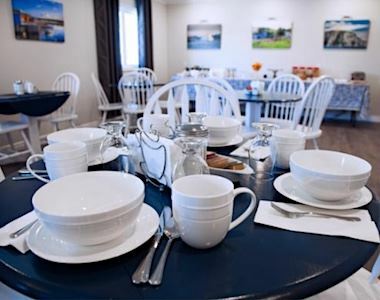 The Alphabet Fleet Inn is conveniently located on Route 340/Toulinquet Street just as you enter Twillingate, Newfoundland. The Alphabet Fleet Inn is a 4-star, 9-room bed and breakfast, also great for groups and families traveling together. Close to boat tours, museums, shopping and restaurants. The Alphabet Fleet Inn offers comfortable single or two double rooms, all equipped with three-piece bathrooms, cable TV, refrigerator, heating controls and free parking and wireless Internet. Queen, and queen/double bed configurations. Wheelchair accessible room available. Rates starting from $135 a night + HST. Street view of the Alphabet Fleet Inn. The sign to watch for when driving in to Twillingate on Route 340. Large single room with a queen bed and accessible bathroom en-suite. Another decorative touch at the Alphabet Fleet Inn. Breakfast is included with the room and consists of berrry jams, breads, yoghurt, cereal, fruit, coffee and tea. Rooms are all decorated with nautical touches. Living room at the Alphabet Fleet Inn.